A few years ago we did a Bar Mitzvah party celebration for Bradley. Now it was his sister Marnie’s turn to have her Bat Mitzvah party in Skokie, Il. Marnie’s Mom Eden told me Marnie loves plays. I thought it would be a good idea to use playbills to showcase Marnie’s favorite plays for her Bat Mitzvah party. I designed a playbill for each of Marnie’s favorite plays and a special one to use on the place card sign in board (more about that in a later blog article). Each Bat Mitzvah centerpiece showcased a different theater play. Pictured above to the left is the centerpiece for Les Miserables. 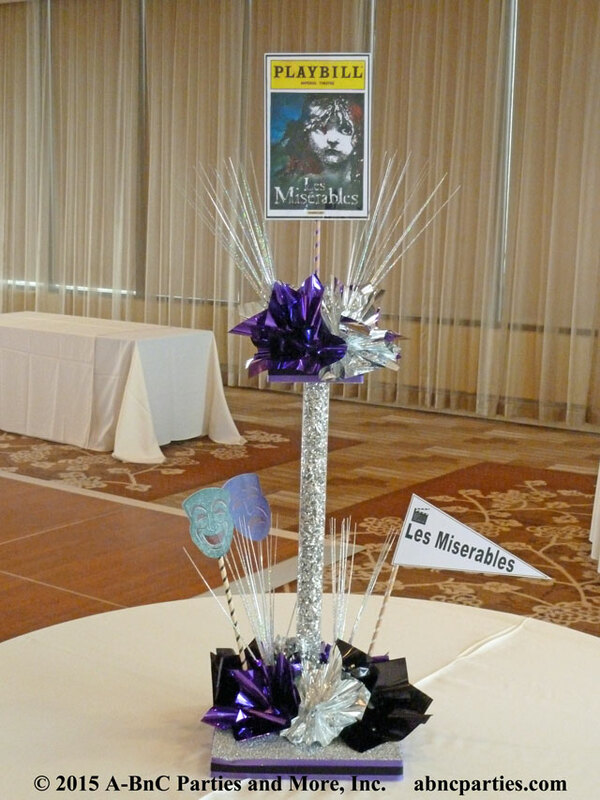 Each of the theater play themed centerpieces had the name of the table printed on both the playbill at the top as well as the on the pennant off the base. This way the guests could easily identify which table they were to be seated at from the place cards. I printed each theater playbill on paper twice and then laminated each. The two laminated playbills were made for each Bat Mitzvah centerpiece so the front and back of the centerpiece would have the exact same image. After laminating the theater playbills, I glued them onto a piece of polystyrene cut to the size of the playbill. 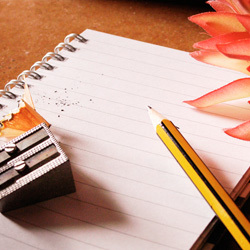 One end of a wooden dowel was inserted into the bottom of the polystyrene. 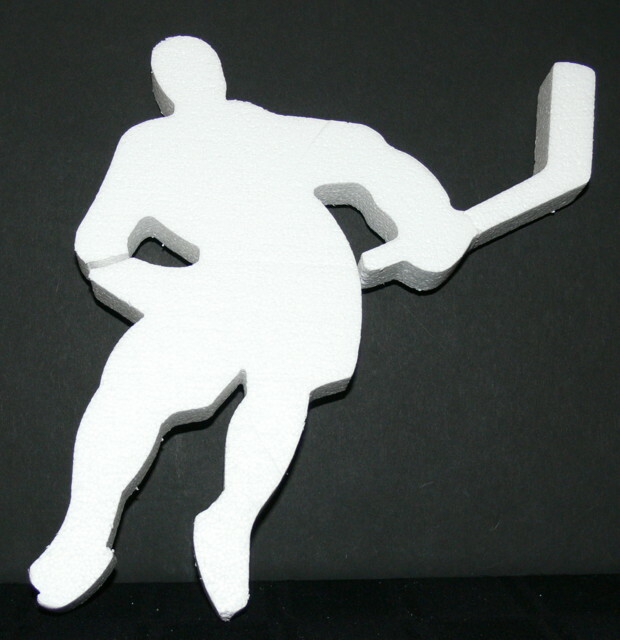 The other end was inserted into the Styrofoam™ base at the top of a very tall, two level centerpiece. This construction showcased the theater playbill at the very top of the centerpiece where it was the main focal point. The flexible plastic tube separated the top and bottom bases. The tube was filled with silver shred. 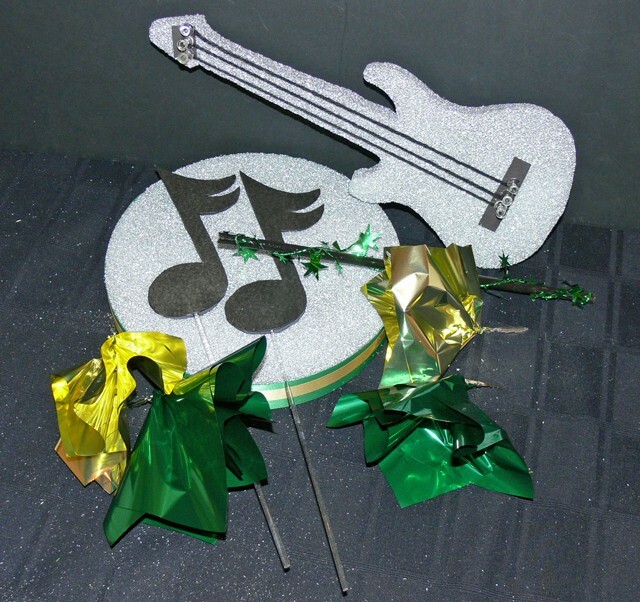 Mylar paper poofs and onion grass added color and flair to the each play themed centerpiece. 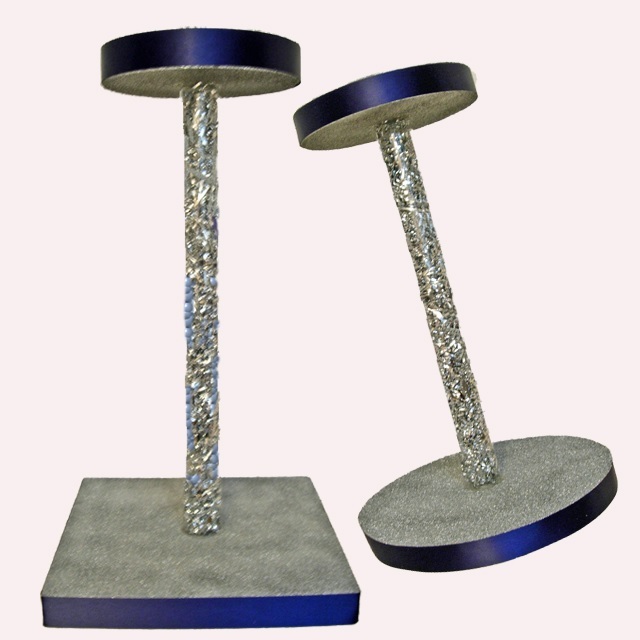 This centerpiece is suitable for any event and can be customized for a Bar Mitzvah, Bat Mitzvah, wedding, rehearsal dinner, anniversary or birthday party as well as any event where custom designed theme centerpieces are used.